shadowmane wrote: So what's the explanation for tornados at night? Although I am "very EU"-oriented, I'd like to see this question addressed soundly as well. My guess - and that's all this is, a GUESS - is that most night-time tornadoes start around dusk, and since (again, I'm guessing) what is important here is a change in electical field as opposed to an increase, perhaps the decreasing field from day to night is just as capable as contributing to a charged sheath vortex spinning up as anything else. Then again, for those truly full-on-nighttime tornadoes, they're certainly as associated with thunderstorms (same as all the others), and thunderstorms are still part of the connective path between ground and sky, so I guess it may not matter all that much when they happen, day or night. For the final time, let me stipulate (even though it should be obvious) that I'm speculating here, and my opinions should not be mistaken for scientific fact. The reason I'm pounding that particular drum so hard is that my #1 bull-moose gold-medal problem with most scientific articles - including the vast majority of things found on sites like phys.org - is all the wild, foundationless speculation written up in a factual manner (not even qualified!) as if announcing a "new discovery", or worse - serves as an unquestioned factual "given"; the foundation upon which yet more speculation is built. Why tornadic activity at 30 degrees latitude ( plus or minus ) ? That is a very tragic event promethean, but surely this is not coincidence. A strong, direct CME hit, and then this? GaryN wrote: That is a very tragic event promethean, but surely this is not coincidence. A strong, direct CME hit, and then this? Two CMEs hit, one on the 18th and one on the 19th. The mainstream seems to strongly deny any connection between flares or CMEs with tornados or other extreme weather events, but this chap says he has 3 terrabytes of data that show otherwise. I havent found any data on Geomagnetically Induced Currents for the area, but see there was a spike measured in Sotland on the 18th, the day the first CME hit, and maybe a small spike on the 19/20th. The article here is talking about a 2012 event. Colorado, according to space weather.com but there is another pattern that deserves attention. new moon to just before full moon. 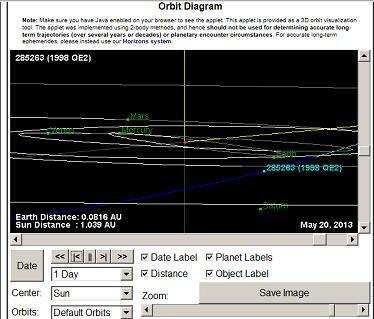 is moving near to an imaginary plane of influence between Saturn, and the moon and the earth. In my study of tornadoes, I found a loose relationship between sunspot activity and the severity of tornadoes. It shows up best in the comparison between tornado fatalities and the sunspot cycle. I don't think that ion beams from CMEs are making it all of the way through the atmosphere, to influence tropospheric airflows, as suggested in previous posts. But an ion beam will increase the degree of ionization in the upper atmosphere, thus strengthening the fair weather field. And I subscribe to the theory that the fair weather field polarizes solid water particles (e.g., hail), resulting in electron transfer on particle collision, which is the fundamental electrification process in the thunderstorm. I'm also of the opinion that tornadoes are electromagnetic, and thus rely on the degree of electrification. Local factors are much more significant in determining whether or not a thunderstorm will form. For instance, if the humidity just isn't there, no storm forms, no matter the EM environment. But if a storm does form, and the fair weather field is stronger than normal, the storm electrification will be more robust, meaning more lightning, and a greater chance of a tornado. also displayed an upside down stair-step pyramid appearance. called Twin Lakes and is a WSR-88D. It's pretty much straight east of Moore. I keep wondering if these high-powered radars we have now might be adding to the energy of storms, and might be one reason that Moore keeps getting hit in recent years. The earliest NWS radar was installed there in 1966. Is it possible that the massive NWS radar east of Moore has an influence on the shape of storms that form to the west, at the edge of the OKC metropolitan area? Another oddity I must mention is that AFAIK the actual NWS headquarters hasn't ever been hit with a massive tornado. So is it possible that the big NWS radar is in some way protective of that location, but possibly "bending" the power of storms around it, into neighboring areas? ElecGeekMom wrote: I am fascinated by the stair-step appearance of this storm. The stair-stepping is an artifact of how the 3D model was built, using a series of individual scans at various elevations. WSR-88 only produces slices of the storm. The software (i.e., GRLevelX) builds a 3D model by connecting similar features in adjacent 2D scans. So the detailed ridges are the elevations of the actual scans, while the smooth shapes in between were interpolated by the software. It's an imperfect process, but for the first time, we get to see what the storms actually look like in 3D, which tells us a lot. I'm wondering what the MPAR ("Multi-function Phased Array Radar") scans would look like. Instead of one complete scan every 5 minutes, MPAR can be programmed to just focus on one thing, taking many more slices, and finishing faster. The apparent storm structure changes dramatically in 5 minutes, because it's picking up precipitation density that is very transient, leaving us wondering what happened to the features in the last scan, and where the new features in the present scan came from. MPAR shows a much smoother transition. For example, compare the composites for the Shawnee tornado, by WSR-88D and MPAR. But I want to see it in 3D. ElecGeekMom wrote: I keep wondering if these high-powered radars we have now might be adding to the energy of storms, and might be one reason that Moore keeps getting hit in recent years. Theoretically, a powerful enough radar could photo-ionize the cloud, increasing the degree of electrification. Radars are certainly hazardous for human beings up-close, for that very reason (i.e., genetic damage due to photo-ionization), so anybody planning to have children someday is advised not to stand next to a radar emitter. But at a distance, I'm not sure if the EM waves are strong enough to ionize anything. Still, when an area like Moore gets hit repeatedly, there just has to be something to that. Some people think that varying conductivities and capacitances in the oil fields are a factor. 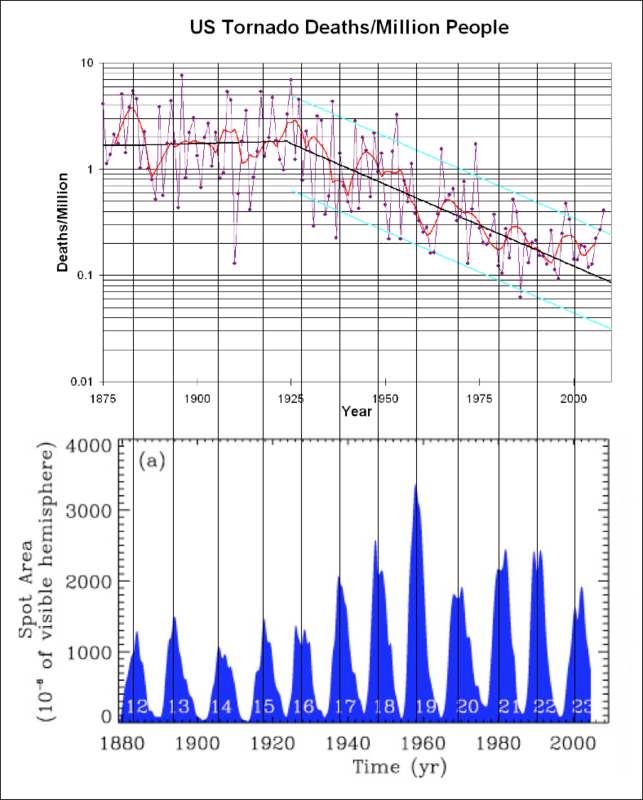 is the jet stream affected by the solar activity we are witnessing ? Thanks, Charles and Promethean, for your replies. I watched the TV coverage in real time during this last outbreak. I was struck by the stair-step appearance of the big Moore tornado as it was photographed by storm chasers. I would say that the rain shroud and/or debris cloud had taken on the stair-step appearance. It was something I don't recall ever having seen before. There weren't as many steps in the storm chasers' footage as there were in the 3D radar sequence, but it was there. I am a 4th generation Okie and am closer to 60 than to 50. I have been intrigued by tornadoes ever since the first time my family took shelter in response to the police cars racing down our neighborhood streets, with their sirens wailing the warning. That was all we had - just a few minutes' warning. These days, they give us maybe 2-3 days' warning. Things have come a long way, but they have to strike a balance between making sure people get the message versus causing a panic over an event that may well not even take place. It's gotten to the point where, if the weathercasters don't frame their message in dire terms (e.g., "Get underground! "), people will be more likely to gawk than shelter. False alarms are still frequent enough that most native Oklahomans' reaction to the first notification is to go outdoors and look around, camera in hand. We joke about it. I've done it myself! But I have learned that when the clouds directly overhead start moving in a circular motion, it's better to take cover. I'm not that daring. Tornadoes seem to strike with surgical precision, wiping out houses on one side of the street, while leaving others untouched or with only minor damage. That, to me, illustrates their electrical nature. Most of them are not mile-wide monsters. In recent years, though, the idea that weathercasters can put out a warning days in advance has made me wonder if they are also tracking the emissions from the sun, and have been able to factor that activity into their forecasts. Tom Olenio brought to my attention the typical timing of earthquakes in Oklahoma (around 13 days after a spike in the K index to at least level 3, and that spike is typically 2-3 days after a CME is observed on the sun). That timeframe seems to be within reason for the improvements in predictions for timing and locations of tornado outbreaks. And in the last couple of years that I've been paying attention, there have been at least two occasions when we logged not only an earthquake, but also co-located, significant thunderstorms or tornado outbreaks that fit the timeline for Oklahoma to receive impacts from the sun's emissions. The recent improvements in radar images are also fascinating to me. More often than not, a long-lasting string of thunderstorms gives the appearance of an old-fashioned, curly telephone cord being dragged along the ground. It reminds me of the appearance of filaments on the sun, before they get all tangled up and explode. The curly thunderstorm strings seem to sprout from the ground in a relatively small location, and eventually dissipate many counties away. Sometimes filaments on the sun seem to behave similarly. I admit I have not studied Charles' tornado article. I need to do that. The current storms look a lot like a curly telephone cord (it's not all in visible mode, so you have to imagine the rest of the cord). I find it ironic the iconoclasticism of the EU exclusion principle has such sensitive trip wires with an exclusive set of hot-key buzzwords and forbidden buttons never to be pushed which conjure imagery so powerful as to crowd highly idiosynchronized crania so overwhelmingly there is insufficient elbow room for fine-tuning physical concepts (AKA preconceived notions). The iconoclasm of the EU exclusion principle can’t possibly apply to ionized matter or polar molecules can it? Is it because I mentioned gravity? I did not imply “that ion beams from CMEs are making it all of the way through the atmosphere”. 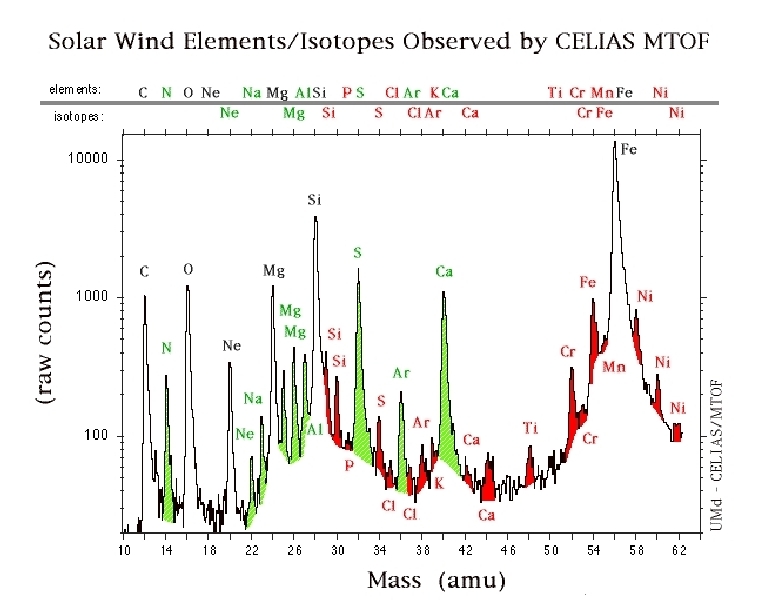 That the solar wind and CMEs are ionized particles is well understood. Hydrogen and Oxygen are among the positive ions, and electrons are negative ions. When the twain shall meet in the right circumstances, they join, this is also well understood. I am so sorry the word “cometary” appears to have conjured a vision of a full blown comet with a tail. I used the word “cometary” in a context intended to be understood as “comet like” or “similar to comets” simply to provide an image of molecular clouds of water molecules coagulating in discrete masses bound by water’s polar attraction to itself. I did not intend to imply, nor, as I understand his literature, did Prof. Louis Franks, that the masses of water entering the atmosphere are of the same high density as water and ice we experience here on Earth, or has been found in the comets from the outer solar system we see plunging into the Sun in SOHO images (what do you think happens to that water, by the way – where does it go?). If you study Prof. Franks several texts, he describes the water comets as “the size and weight of a small house”. Do some math; what would the mass density be with the weight-to-volume ratio of a house? Large or small, a house has a lot of empty volume. The point is, the masses of water entering the atmosphere are not very dense and Prof. Franks described them as such, in fact he describes them as “a cloud”. His mass reference is “20 to 40 tons”. Do some more maths; on Earth, water weighs 62.4 lbs per cubic foot. 30 tons is less than 1000 cubic feet, smaller than a 10’ cube. Use some logic people. The “Solar Water” or “Comet (like) Water” is in the forms of diffuse cloud-like masses. Envision them as regions of high humidity within the Solar System. Water’s polar attraction to itself (the reason it has surface tension) results in clumps of humidity, but in the vast emptiness of space the density is low compared to our usual consideration of the terms “humidity”, “comet”, “cloud”, “ice”, “water”, “etc,” in terrestrial conditions we are familiar with. A CME can be 20 to 30 Billion tons of solar matter. Again, do the math, .75% of 20-30 Billion is a lot of Oxygen. Do some more maths and postulate how much Oxygen in a CME may fall into the influence of Earth’s magnetic and gravity fields. Assuming Physical Laws are the same throughout the local universe, the positive ions of Oxygen and Hydrogen and the negative ions (electrons) take part in electro-chemical reactions when the conditions are right, such as when they are trapped in Earth’s magnetosphere and cool below their ionization energy in the shadow of the planet. The other positive ions besides Oxygen are taking part in chemical reactions of their own when their conditions are right, but this particular discussion is about H and O and the necessary electrons to = H2O. When the Solar Wind and CME mass enters the Earth’s magnetic field, as described in the links below, what do you think happens to the H and O and electrons? The Solar Wind giveth, and the Solar Wind taketh away, is obvious. Sorry to cut and paste, but I think some here need to study some information about this. … and it should be enjoyed first to make it easier to understand this conjecture that water is entering the atmosphere and with it the associated energies of electrical charge and inertia of mass in motion. This is the CME that hit us on the 20th-21st of May. http://www.thesuntoday.org/thesuntoday/ ... im-den.gif Click the link to see a graphic of the Sun’s and the solar wind’s electromagnetic properties and mass ejecta in the Solar System with the solar wind and the CME in motion over several days, and the impact of the CME with Earth. This is information about the magnetic portals through which solar matter from the Solar Wind and CMEs enters Earth’s atmosphere. Data from NASA's Polar spacecraft, circa 1998, provided crucial clues to finding magnetic X-points. Credit: NASA Because Polar carried sensors similar to those of MMS, Scudder decided to see how an X-point looked to Polar. "Using Polar data, we have found five simple combinations of magnetic field and energetic particle measurements that tell us when we've come across an X-point or an electron diffusion region. A single spacecraft, properly instrumented, can make these measurements." Below: In a presentation at the 2008 Plasma Workshop, Robert Fear of the University of Leicester, UK, presented some alternatives for the magnetic topology of FTEs. Possibilities include ropes (left column), cylinders (middle column), or bubbles (right column): abstract. ElecGeekMom wrote: I was struck by the stair-step appearance of the big Moore tornado as it was photographed by storm chasers. Do you have a link to the photography? Maybe I'll have an intelligent explanation -- maybe not. ElecGeekMom wrote: Tornadoes seem to strike with surgical precision, wiping out houses on one side of the street, while leaving others untouched or with only minor damage. Right -- and even if the "tornado" is a mile wide, the damage path might only be 100 yards wide. So there is a sub-vortex inside the outer vortex. The sub-vortex might do EF5 damage, while the outer vortex only does EF2 damage. Since that just isn't possible in fluid dynamics, it's another one of the proofs that there are EM forces in tornadoes. ElecGeekMom wrote: Tom Olenio brought to my attention the typical timing of earthquakes in Oklahoma (around 13 days after a spike in the K index to at least level 3, and that spike is typically 2-3 days after a CME is observed on the sun). If you know of somebody who has found a correlation between CMEs and tornadoes in the data, I'd love to see it. The CMEs have to be Earth-bound to matter, of course. And there are many factors that must be present for a tornado to form. For example, if the CAPE just isn't there, there won't be any thunderstorms, much less tornadoes. But if CMEs are a contributing factor, it should show up in the stats. If I had to guess, I'd say it's there, but nobody ever took the time to do the analysis. OK. I finally found a photo that was posted on Facebook, showing the tornado that came down near Tulsa yesterday. It shows the kind of stair-steps I was talking about. This is very similar to what I saw on TV when I was watching the storm coverage for the Moore tornado. Regarding the predictions--I have been making notations in my Daytimer, first about EQs, and now about storms and EQs, since oftentimes a day that I mark for EQs has severe weather instead. It's not a nice, organized collection of data. I haven't decided on the best way to compile it. I like the monthly tables that the weather service produces. If they would only add columns for EQs and flares and geomagnetic storms, I think it would come together faster.